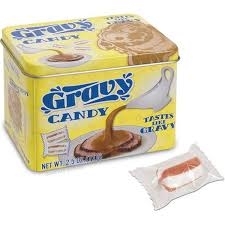 These brown and white striped candies taste just like gravy! They come in a beautifully decorated tin and are individually wrapped. You can now have that herb infused gravy taste all year long; not just with your favorite holiday meals!